Please allow 2 business days for processing plus delivery time on all plastic Gift Card orders. Gift Cards will be delivered via Canada Post standard mail. A $3 flat rate shipping fee will be added to your order for each mailing address entered. No problem. If you need your gift to arrive a little faster simply send a Turtle Jack's eGift Card instead. There are no processing or delivery fees on eGift Cards. 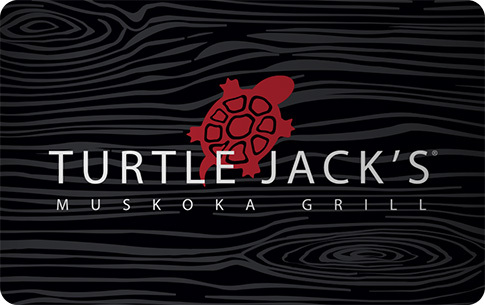 Turtle Jack's gift cards can be redeemed at any of our restaurants. They never expire and have no transaction fees. Ordering cards for multiple lucky people? It’s easy — select Quantity 1, enter the recipient’s mailing address and add the card to your order. Add another card to your order following the same easy steps for each recipient and we’ll mail their gift cards directly to them, leaving you to sit back and relax! Select from one of the addresses above that you previously sent a gift card to or enter a new mailing address below.